Clearance Deal. Only 10 in stock. First come, first served. Compact light goes anywhere! 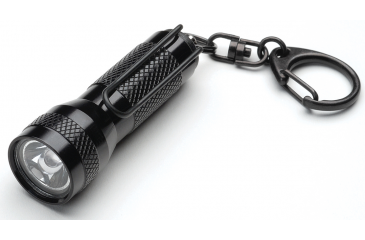 LED technology in a keychain light! Battery 4 Alkaline Button Cells (either LR44, AG13, LR1154, or A76) Bulb 100,000-hour high- intensity Light-Emitting Diodes (LEDs) with reflector optics. Material Anodized, machined aircraft aluminum 6000 series. Special Features Reflector optics; Waterproof; Rotary head switch; Breakaway lanyard; Snap hook with swivel; Pocket clip.